Mono Lake –a large, shallow saline soda lake in Mono County, California. Mono Lake is an immense inland sea, spreading over 70 square-miles. The lake is one of the oldest ones in the northern hemisphere and was formed some 800,000 years ago. In winter, its shimmering blue waters reflect the snow-capped Sierra Nevada mountains creating a picture-perfect scenery. Have you ever visited this area? Jungfraujoch, the Mountain that Took My Breath Away ... Literally! Wow, quite staggering thinking about something that is 800 000 years old. I have to admit that I haven't heard of Mono Lake, but your photo makes it look a beautiful place to visit. Anda, this is kind of crazy. I visited Mono Lake today (I am in Bishop right now). The lake is surreal. We visited the South Tufa Reserve and that was mind blowing. I felt like in another planet. Quite a coincidence, Ruth, isn't it? Welcome back, Esther! We missed you. I love simple photo posts like this, but like you, mine tend to get long. I lived in California for 15 years, mostly in San Francisco, but we had a house in Lake Tahoe. Which means I may have come quite close to Mono lake, but I don't remember it. It's quite a lovely shot. Thank you, Rhonda. You've probably never seen Mono Lake is you don't remember it. It's something you'd never forget. Anda, I love photographing Mono Lake but have never been in winter. Gorgeous! I feel for you, Vlad. I know what Bucharest can be when it's hot. Gorgeous photo and scenery! 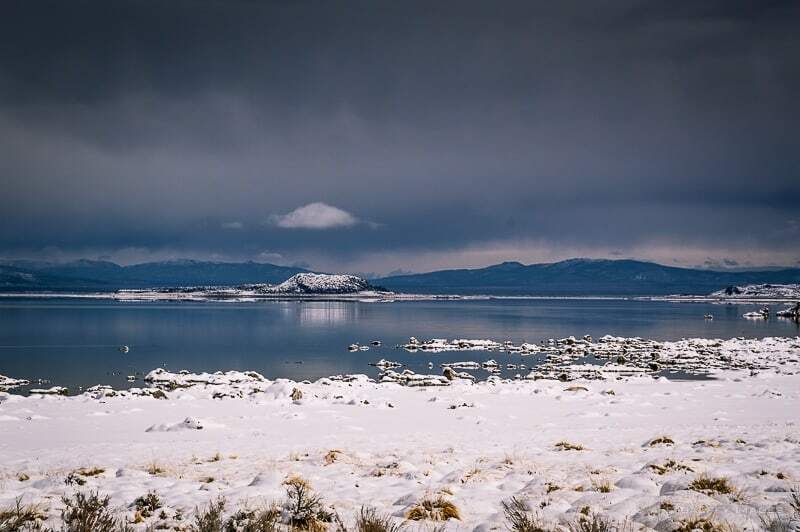 We love Mono Lake but have never visited during winter. The tufa towers and all those birds there are worth the visit. We visited called in at Mono Lake many years ago. I remember it was beautiful. One of those places you never forget. Thank you for reminding me of it. I've never ventured out of large cities in the US...but will definitely do so next time I'm there...as so many parts look so spectacular. Including this lake! California has some of the most beautiful scenery in the world, Fairly. You should definitely venture outside the large cities. I've never been to Mono Lake but I have seen photos - but never from winter before. What a great shot!